Ala Moana: Wave heights 2-4 feet over the next day or so. Makapuu: Wave heights 3-5 feet over the next day or two. Sunset Beach: Wave heights 3-5 feet over the next day or two. Makaha: Wave heights 2-4 feet over the next day or so. 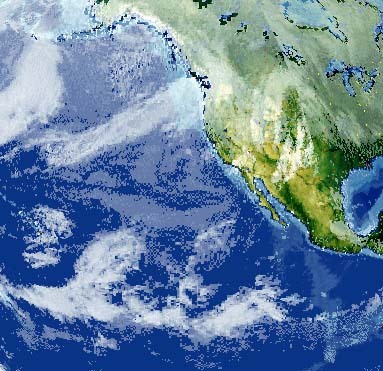 Coastal waters: Winds east at 15-25 knots through tomorrow. Waves 10-14 feet. Channels: Winds east at 20-30 knots through tomorrow. Waves 14-18 feet. Big Island: Hilo - Windy; showers tonight and tomorrow. Low tonight 68. High tomorrow 78. 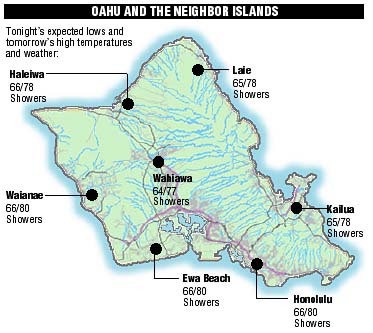 Kona - Showers tonight and tomorrow. Low tonight 70. High tomorrow 80. Maui: Windy; showers through tomorrow. Low tonight 68-74. High tomorrow 76-84. Kauai: Windy; showers through tomorrow. Low tonight 68-74. High tomorrow 74-82. Lava continues oozing down Pulama Pali, but the flow front remains about 1 1/2 miles from the sea. Sunset tonight -- 5:49 p.m.
Sunrise tomorrow -- 6:53 a.m.
Moonset tonight -- 2:13 p.m.
Moonrise tomorrow -- 2:31 a.m. The ultraviolet index rates your risk to sun exposure. The higher the number, the greater the risk. Listed is tomorrow's forecast: 15 is the greatest risk. Thurs. 1:16a.m. 1.5 ft.	7:00a.m. 0.7 ft.
12:16p.m. 1.4 ft.	6:53p.m. 0.0 ft.
Fri.	1:53a.m. 1.7 ft.	8:03a.m. 0.6 ft.
1:01p.m. 1.2 ft.	7:20p.m. 0.0 ft. Sat. 2:26a.m. 1.9 ft.	8:55a.m. 0.6 ft.
1:42p.m. 1.1 ft.	7:45p.m. 0.0 ft.